Earseeds, Not just for ears! 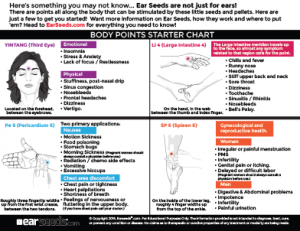 Did you know that Ear Seeds are not only great on the ears, but they are also a tool that can be used to stimulate certain body points? Although acupuncturists will often use a unique combination of points to treat specific ailments, there are some “go-to” points along the body that are often used and easy to find. Enter your email below to download this free printable chart to help you locate the points and learn many of their traditional uses according to Chinese medicine.